Examine strategic national security issues, global hot spots, and decision making at a strategic level from a non-military and cybersecurity lens. During this graduate-level course, you are immersed back into a college learning atmosphere for three weeks at Indiana University’s beautiful Bloomington campus. Participants graduate with a newfound understanding of the critical thinking and decision making skills necessary to navigate today’s complex national security landscape. You are immersed into a robust campus experience that maintains a healthy student to faculty ratio. The class participate in discussions and debates, leveraging their own professional experience with the lessons and experiences of the faculty and speakers as it applies to the US foreign policy and national security realm. Along with learning, the students also exercise their personal skill sets throughout the program, which enhances their overall professional development. One of the most pressing challenges facing leaders in both the public and private sector is the weaponization and criminalization of cyber capabilities. Whether it’s a disinformation campaign waged by a near-peer adversary or the theft of credit card information, it is now clear that cybersecurity is now and will be a major element of national security and business strategy going forward. Fellows will explore the offensive and defensive tools of cybersecurity, discuss the laws of war and governance as they apply in cyberspace, and visit cutting edge facilities that are responsible for data protection, utilization, and storage. In addition to graduate-level course work, the Fellows will engage in a capstone-applied learning project with their classmates. The goal of this team project is to allow the students to collaborate and work through difficult issues currently affecting the U.S. defense sector and will continue to affect this realm long term. The topics are consulted with senior military leadership and the final projects will be briefed to a panel that will include several of these senior leaders. Upon graduation, the students will receive a joint certificate from the IDB and IU and membership into the growing alumni network of the Institute for Defense and Business. If you fit this profile and are interested in attending a future offering of the IU-IDB Strategic Studies Fellows Program, please contact Zebrina Warner, Program Director. Faculty members and speakers for this program join us from many different departments and schools at Indiana University as well as from other schools and the private sector. 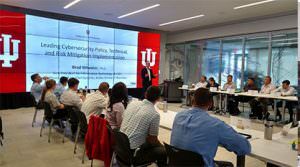 The two core instructors are Professor David Bosco for the National Security and Global Flashpoint portion and Dr. Scott Shackelford for the Cybersecurity and Team Projects portion of the program. Both are esteemed professors in the academic realm of National Security. The faculty members that complement the weekly themes hold both the academic and personal experiences to discuss these topics. Their innovative methods and thinking styles will expose you as a student to the insight of how to strategically think and operate in a high-level atmosphere. The Institute for Defense and Business (IDB) has enjoyed the collaborative nature of this program, which is a result of a robust partnership that has lasted over 15 years. IDB administers the development and delivery of the IU-IDB SSFP curriculum in cooperation with Indiana University’s Kelley School of Business (KSB) and School of Global and International Studies (SGIS). This program is unique in that it offers interdisciplinary perspectives and opportunities for the students to learn from. Graduates receive a joint certificate from IDB, Indiana University’s Kelley School of Business and School of Global and International Studies. Military students are either centrally funded or funded by their units. The sponsoring military entity normally selects the students and submits an application package to be approved by the IDB. The majority of your day will consist of going to class, reading in preparation for class, and working with your team on your action learning projects. On average, classes are three to four hours a day. There are many days that classes can add up to six hours long, based on the topics and speakers. During class, you are given the opportunity to delve into your personal experiences and the knowledge you gained from the readings to debate high-level strategic concepts and theories with renowned faculty members. Blocks of time will be set aside each day for both Independent Study and for Team Project Group Work. The faculty members and speakers of this program are pulled from across departments and schools at Indiana University as well as from other schools and the private sector. The two core instructors are Professor David Bosco for the National Security and Global Flashpoint portion and Dr. Scott Shackelford for the Cybersecurity and Team Projects portion of the program. Both are esteemed professors in the academic realm of National Security. The faculty members that complement the weekly themes hold both the academic and personal experiences to discuss these topics. Their innovative methods and thinking styles will expose you as a student to the insight of how to strategically think and operate in a high-level atmosphere. Over the course of three weeks, you will read scholarly articles, official government documents, and/or excerpts from books. The reading is selected by the faculty members to ensure that it correlates to the classes and sessions you will attend. The readings will provide all students a solid foundation of knowledge needed to engage and participate in the lectures and presentations. During the first week of the program, students will be separated into teams of approximately five members for this action learning project for a key sponsor, the Indiana National Guard. Each team will be given a topic related to Cybersecurity and the team is expected to spend the three weeks researching the issue with the end goal of proposing possible strategic solutions under the guidance of Dr. Scott Shackelford and Professor David Bosco. Each team will be responsible for a paper as well as a presentation. On the final day of the program, teams will present their projects in front of a panel composed of the SSFP faculty, group mentors and other senior military leaders. These action learning projects allow for students to combine their personal experiences, the lessons and readings from class, and additional research on a strategic approach towards solving a key issue faced by the military.